I’ve had the same best friend since I was 4 years old, she’s more like a sister than a friend at this point. When she got pregnant I was almost as excited as she was and now her growing little girl is one of my favorite people to hang out with. So, for her 2nd birthday, I decided to make her an awesome birthday cake and cupcakes. The cake was so popular, there was literally none left! Now, I’m not usually a fan of using cake mixes because I like to bake from scratch; however, I know some people prefer it for convenience. This cake is so moist with that perfect melt-in-your-mouth flavor, not to mention it’s white so you can do fun colors for the layers. This recipe does make enough for very tall layers, so you can certainly scale back for a smaller cake. I finally found a great cream cheese frosting that I can decorate with, this frosting will pipe to perfection! I have yet to try it on a cupcake but hoping it will work with some of the softer frosting styles (it’s definitely not stiff enough for complex flowers, etc.) The trick – you can’t use both butter and cream cheese. Together they are too soft and melt easily. Preheat oven to 325 degrees and butter your cake pans. I also add a round of parchment paper to the bottom of the pans and the parchment paper again. This helps the cakes to slide out quick and easy! Sift together all dry ingredients – 2 boxes of white cake mix, 2c flour, 2c sugar, 1 1/2t sea salt – in a large bowl (I use my stand mixer bowl for less mess). Add the 8 egg whites, 2 2/3c water, 4T oil, 2c sour cream, 2t vanilla, 2t almond extract; beat on low speed for 2 minutes (if you’re like me, you’re largest bowl will be very full from this recipe – so just make sure you have a bowl large enough or cut the recipe in half). Fill pans ¾ full (for big layers) and bake for 30-45 minutes. The time will vary some based on the size and number of pans and how full you make them. 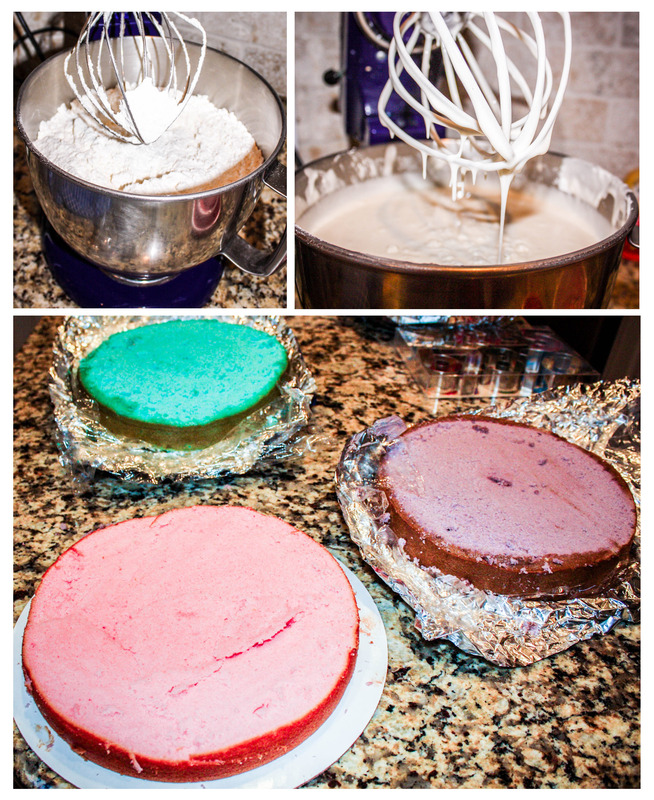 Cakes are ready when a cake tester comes out clean (there should be a golden hue to the edges of the cake). Allow cakes to cool on the rack. Remove from pans after about 15 minutes. I leveled the cakes as well for decorating purposes. Wrap cakes in seran wrap and then aluminum foil and place back in pans to freeze for up to 1 week. Remove from freezer 24 hours before your event to frost. In the bowl of a stand mixer fitted with the paddle attachment, beat the 16oz cream cheese until smooth. Sift the 1c powdered sugar into the bowl, beating to combine, then add the 2-1/2t vanilla extract. Remove the paddle attachment and attach the whisk. Scrape down any cream cheese from the sides of the bowl. Next, while beating at medium-high speed, stream in the cold 1-1/3c heavy cream until the frosting is thick enough to pipe. Please watch this video from Joy of Baking, which features the frosting recipe and addresses potential issues to prevent the frosting from being too thin. Add frosting between cake layers and stack cake. Then, do a thin layer of frosting to cover any ‘crumbing”. Frost the cake as desired. Voila, you have one awesome layered cake!